This article is about the quest. 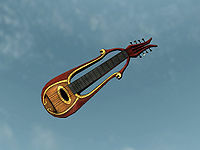 For the item, see Finn's Lute (item). Return an invaluable lute to Inge Six Fingers. Talk to Inge Six Fingers. Locate Finn's Lute in Stony Creek Cave. Return for your reward of a 1-point increase to all Stealth skills. Right after the Burning of King Olaf ends the quest Tending the Flames, talking to the otherwise authoritarian Inge Six Fingers will be somewhat wistful. When asked, she will tell you that a year ago, thieves broke into the College and stole her most precious item: the very first eight course lute ever created, namely Finn's Lute. As the Dean of Lute, Inge has been devastated ever since, but recently learned the location of the thieves, specifically Stony Creek Cave, a cave in southeastern Eastmarch. A small pond hides the entrance to the cave, complete with a dock and a boat. Upon entering, the sight of a waterfall and a dead Breton hanging from a tree trunk hints at things to come. Follow the only available path upstream and fight the expected bandits trying to protect their treasure. When the path splits in two, head right and beware of the swinging mace trap right before the chamber with the bandit leader. Pick the fight and search the body for Treasure Map X, then look around the area for interesting items, including a copy of the Illusion skill book Mystery of Talara, Part 4, an unusual gem, along with a few ingredients and an alchemy lab. Finally, open the chest and claim the lute and some valuable loot. Before exiting the cave, it is possible to investigate the rest of the cave which will net you another fight against a bandit, along with a locked treasure chest, two moonstone veins and a waterfall hiding a shortcut from Kagrenzel. Exit the mine the way you came and return to the Bards College. Back at the College, Inge Six Fingers will be overwhelmed with joy. As she is unable to pay what the lute is worth, she will instead teach you a few tricks she has picked up over the years, and raise each of your Stealth skills by one point. This includes Alchemy, Light Armor, Lockpicking, Pickpocket, Sneak, and Speech. After you turn in the quest, the lute will remain in your inventory, still marked as a quest item. Finding the lute before the quest is assigned may result in the lute being stuck your inventory as a quest item even after finding Inge Six Fingers and telling her you have found it. Finding the lute early may also result the quest objective becoming stuck in your journal, even after returning the lute and receiving your reward. To resolve this, click on the "I've found Finn's Lute" option in dialogue when you speak to Inge, rather than the "Why are you sad?" option. It works out just as if you had accepted the quest and then found it. Alternatively, you can use the console code setstage BardsCollegeLute 40 after accepting the quest, which will update it to telling you to give Inge the lute, allowing the quest to proceed as normal. 20 Thieves stolen [sic] Finn's Lute from the Bards College over a year ago. Inge Six-Fingers has asked me to recover the lute from their stronghold. The following empty quest stages were omitted from the table: 0, 15. On the PC, it is possible to use the console to advance through the quest by entering setstage BardsCollegeLute stage, where stage is the number of the stage you wish to complete. It is not possible to un-complete (i.e. go back) quest stages, but it is possible to clear all stages of the quest using resetquest BardsCollegeLute. This page was last modified on 2 November 2016, at 01:29.